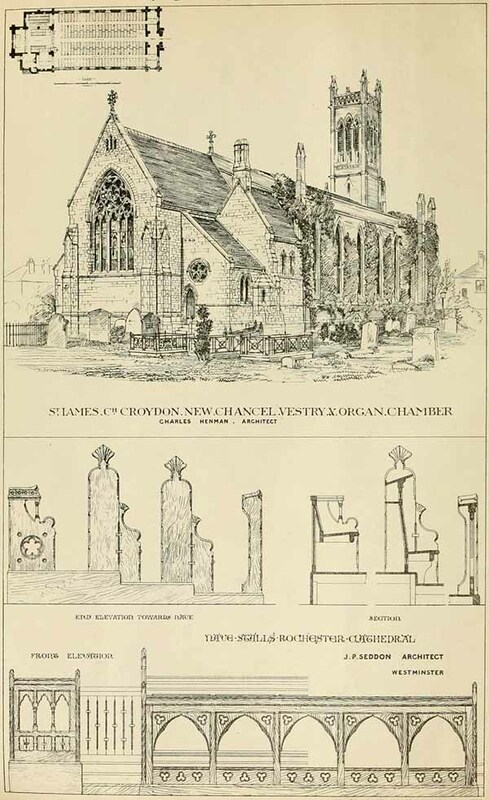 “The Church of St. James’s, Croydon Common, was erected about forty years since. It is a brick building (in a style which then very generally passed current as Gothic) which for baldness and meanness of appearance and incongruities in the details could hardly be surpassed. There are galleries to three sides of the nave ; the organ-chamber was in the tower, and the dimensions of the chancel were 17ft. wide, by 10ft. deep. The considerable advance which has of late years taken place amongst the general public in knowledge of architectural style and in artistic taste caused many of the congregation to become dissatisfied “with the building, and a movement was set on foot for the improvement of the church. The original intention was merely to modify the present building, and drawings were got out accordingly ; but it was considered that their execution would certainly be costly, and probably unsatisfactory ; so it was determined to have plans prepared for an entirely new church, to be built by instalments, as funds would permit. The illustration we give in this week’s issue shows the first portion erected, consisting of a chancel S0ft. long, 21ft. wide, and 36ft. high to the underside of the boarded ceiling, internal dimensions ; at south aisle to chancel, an organ-chamber, vestry and heating chamber. The cost of this portion, which is being carried out by Messrs. D. Laing & Co., of 41, Parliament -street, is about £2,200, exclusive of fittings and warming apparatus. Messrs. Benham and Son have the latter in hand for the whole church. The materials for the new building are coursed Kentish rag facings, with Bath stone dressings and tracery, and Stafford- shire tiles on the roofs. The east window is to be filled with stained glass as a memorial to the Rev. H. C. Watson, M.A., the late Vicar. This has been designed by Mr. Walter H. Lonsdale. The clerk of the works is Mr. S. A. Clark. The architect is Mr. Charles Henman, A. R. LB. A., of Croydon, and 64, Gannon- street, E.G.” View published in The Building News, October 29th 1880.